Book in One Word: Cute! What called me to Tell Me Three Things was the fact that, yes, it's sure to be a cute and fluffy contemporary that's sure to hit the spot. But it also just happens to have a premise with major You've Got Mail elements, and if that's not compelling then I don't know what is. So when the eBook was on super sale I snatched it up, and not too much time later I picked the book (well, my Kindle) up and decided to see if it was as sweet and delicious as three heart-shaped waffles. And it kinda was. Tell Me Three Things immediately pulled me in--and I mean pulled me in--from page one, which starts right off with Jessie's emails and introduction to Somebody/Nobody, aka SN. SN knows who Jessie is--he or she did, in fact, email her--but Jessie hasn't the faintest clue who SN is, except that he or she goes to her school and can tell that she's lost--and wants to help her find her way. What ensues is a series of correspondences between Jessie and SN that are sweet and funny and honest and utter perfection, and if I'm being completely honest? I would and could read an entire book that's composed entirely of their messages. But somewhere along the way that great beginning started to wane off. The messages were still present, but the rest of the story wasn't quite as interesting and didn't do as well with piquing my interest. Jessie (unwillingly) moves to California after her widowed father marries another widow, and Jessie gains a rather unexpected new stepmother, stepbrother, and finds herself living in a whole new world. With the exception of SN--whose identity we are kept guessing at (and I was right, thank gosh)--the majority of the secondary characters felt a little flat. They needed just a bit more dimension to really be there and have presence and feel real. (For example, there's a potential love interest and a best friend who just didn't do much for me and they probably should have. There was one particular character who floated my boat, aside from SN. But I won't tell you who, except that he wears like the same thing every day.) I wouldn't say it's a bad thing that the messages were my favorite part, but it's not necessarily a good thing that few things were as interesting. The real and actual best part of Tell Me Three Things was the ending, which was one of the cutest and most adorable endings ever. I loved and adored it. I just wish everything in this book was on the same cute and fun and sweet level, because instead I'm left with like one really good homemade waffle and a couple frozen waffles that are just okay. I needed parts of the story and the characters to be less like outlines and to be filled in and given dimension so that they'd actually feel like bigger parts of the book. But those messages and that ending and that ship. Ah. So waffle-ful. Would I reread it? It could happen. Would I purchase it? Maybe someday. Who would I recommend it to? 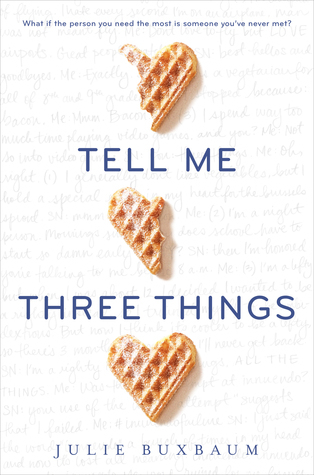 Lovers of contemporaries, cuteness, waffles, books with lots of (literal, physical) messages, and You've Got Mail. I read this book recently and my feelings for this were pretty meh. I didn't connect to the characters at all and I found it to be nothing special however I did love the mystery of finding out who SN was! Glad to hear you enjoyed it though! I liked it, not loved it too!! It was felt like it followed a "YA CONTEMPORARY ROMANCE FORMULA" instead of just flowing along. I also guessed who SN was (I thought it was way too obvious). Maybe if I was surprised by a reveal, I would have felt better about the book?? I did think it was cute and I liked parts of it, but I wanted MORE.